The compact camping module QUQUQ is ideal for those who love free and spontaneous travelling, without the need purchasing a motorhome. QUQUQ combines kitchen, bed and storage space in one single box. Simply put QUQUQ in the trunk and the mini-motorhome is ready for the trip. Bon Voyage! The QUQUQ module is thoughtfully designed and absolutely practical: So the lying surface, including 10 cm strong cold foam mattress, is unfolded in a handle. No assembling of components, no re-arranging in the vehicle. Also the kitchen with 2-flame stove, 20l of freshwater, sink, workspace and storage space are ready to use immediately and accessible at any time. Completely without conversion. The QUQUQ box is extremely sturdy and light in weight at the same time for easily handling. All used materials such as aluminium, waterproof plywood and stainless steel guarantee long-term functionality. 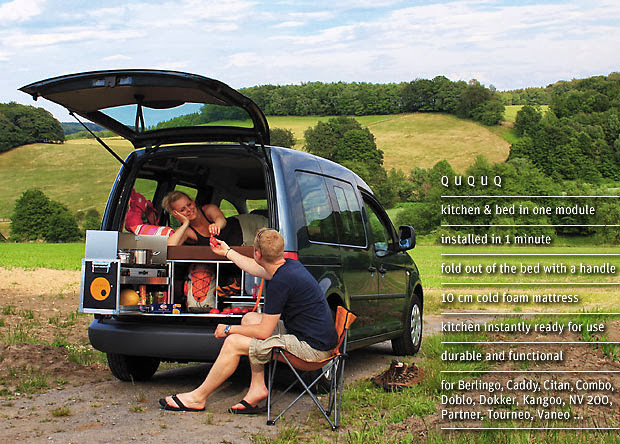 Should you change your vehicle once – no problem: QUQUQ fits in almost all high roof station wagons such as Berlingo, Caddy, Citan, Combo, Doblo, Dokker, Kangoo, NV 200, Partner, Tourneo, Vaneo.